Dr Andrew Arnold adjusting two-week old Harvey for the first time at Cranbourne Family chiropractic. 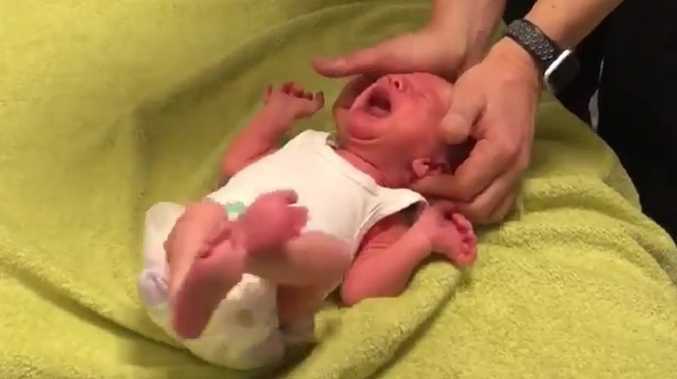 A MELBOURNE chiropractor filmed manipulating a two-week-old boy must not treat children aged under 12 while he is investigated by authorities. Andrew Arnold was put on an "undertaking" by the Chiropractic Board of Australia on Thursday. "I will not undertake any chiropractic treatment of children from birth to 12 years," the undertaking published on the Australian Health Practitioner Regulation Agency website reads. Video grabs of Dr Andrew Arnold adjusting 2wk old Harvey for the very first time at Cranbourne Family chiropractic. On Thursday she confirmed she had heard back from AHPRA and the Chiropractic Board of Australia. Cranbourne Family Chiropractic has since shut down its Facebook page where the video was posted in August. It also showed Mr Arnold using an instrument to deliver a controlled impulse on the baby's neck and back, causing it to scream. Dr Andrew Arnold working on Harvey. The Chiropractic Board of Australia and AHPRA have been contacted for comment. Video grabs of Dr Andrew Arnold adjusting Harvey, two weeks old, for the very first time at Cranbourne Family chiropractic.